Most of the members of the James-Younger Gang had ridden with Southern guerrillas William Quantrill and Bloody Bill Anderson along the Missouri-Kansas border region during the Civil War (1861-1865). In retaliation for the guerrillas’ raid on Lawrence, Kansas, which left 185 men and boys lying dead on the ground, the section of Missouri that bordered Kansas was completely depopulated to deprive the guerrillas of their support network. When the war ended, the guerrillas and their families tried to rebuild but they suffered frequent harassment and found it nearly impossible to obtain loans from Northern controlled banks. Hardened by years of partisan warfare, a number of them began robbing banks, initially under the leadership of Archie Clements. After his death in a shootout in December 1866, Frank and Jesse James, and Cole Younger became the core of the gang. A smooth-talking railroad representative intimidates poor, ignorant farmers into selling their land to the St. Louis Midland Railroad for a pittance, claiming that the government will take it anyway even if they don’t sign. Aware that the James brothers are organizing their neighbours, the railroad representative throws a bomb that blows up the James’ house and kills their mother. A furious Jesse quickly forms a gang and they start robbing trains, targeting the Midland Railroad because it started the whole problem. Several years later, Jesse’s girlfriend, Zee, makes a passionate plea that he surrender because otherwise the violence will get into his blood and he will become like a wolf. Learning that instead of receiving a light sentence, he will be hung, Jesse escapes. However, it becomes harder and harder to avoid capture and a member of the gang has agreed to betray him. “After the tragic war between the states, America turned to the winning of the West. The symbol of this era was the building of the trans-continental railroads. The advance of the railroads was, in some cases, predatory and unscrupulous. Whole communities found themselves victimized by an ever-growing ogre-The Iron Horse. 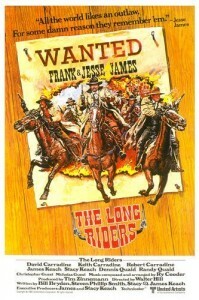 It was this uncertain and lawless age that gave to the world, for good or ill, its most famous outlaws, the brothers Frank and Jesse James.” The opening narration contains the only mention of the Civil War, casts the railroad in the villain’s role, and ignores both the James brothers’ participation in the war and the other members of the James-Younger Gang, namely the Younger brothers. 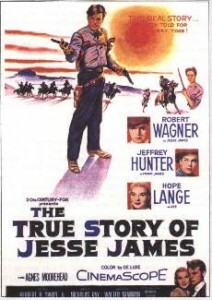 This is fitting since the plot has only the slimmest connection to the actual Jesse James. The romantic interest, Zee, is the local newspaper editor’s niece, not Jesse’s cousin, presumably because cousins marrying each other would appear a little too hillbilly. Zee’s uncle steals the movie with editorials on topics such as shooting all the lawyers is the only way to bring about law and order or there will be order only when all the railroad presidents are taken out and shot. He was probably modeled on John Newman Edwards, Confederate general Jo Shelby’s former adjutant and editor of the Kansas City Times, who wrote editorials in support of the James brothers and helped Jesse write his frequent letters that provided alibis and protested his innocence. The film does not whitewash the misery of living on the run, never staying long in one place. Jesse is not even there for the birth of his son and Zee does not hide the fact that she hates living like an animal, scared of every step on the porch. However, the real Zee stayed with Jesse until the end. While it is true that the gang was destroyed at Northfield, Minnesota, the trap is simply ludicrous, even for a Hollywood movie. The filmmakers seem to view the fact that the James-Younger Gang was taken down by ordinary townspeople who had no warning of the robbery as a demeaning end for such famous outlaws, and have produced a more cinematic end. 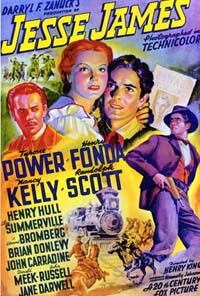 Randolph Scott is his usual tough, decent man as Liberty’s marshal and rival for Zee’s heart but Tyrone Power gets most of the screen time, and is presented as a successful bandit, a Robin Hood type, who is protected by the community. 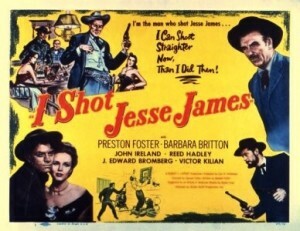 It is historically inaccurate, since aside from their names and Bob Ford, it gets almost nothing right, but it is a very enjoyable film that moves along well and has a surprisingly bleak view of the price of the outlaw life.